Set in the foothills of the Carrascoy mountains, in Fuente Alamo. The Resort here at Hacienda Del Alamo is in an ideal location. It offers not only a great range of services, amenities, and transport links But also some of the best resort properties in the Murcia Region. The resort here at Hacienda Del Alamo Golf has so much to offer for both visitors and people who want to live or own a holiday home here. From the gated 24hr security as you first enter the resort, you are immediately greeted with the manicured gardens and trees which line the entrance road to the resort. The first part of the resort you will come to are the apartments in the Los Olivos Community. 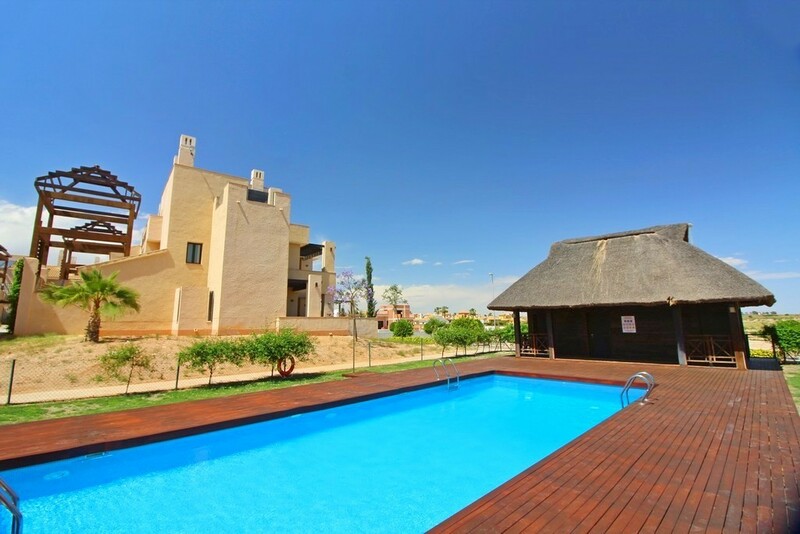 The properties here are available in 2 and 3 bedroom options and come with some beautiful features from the sunken jacuzzi baths to the rooftop solariums, and large communal pools. 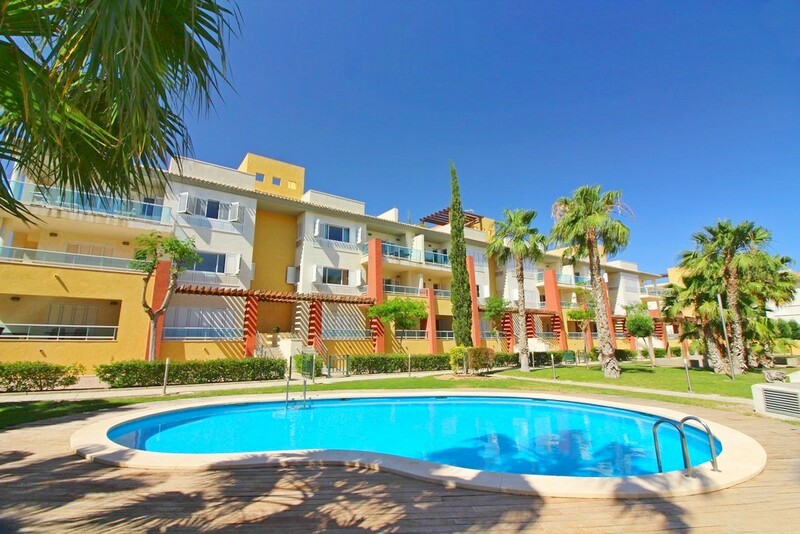 Apartments for sale in Hacienda Del Alamo Golf Resort Los Olivos community start from just €95,000!. Moving further up the resort, you pass the selection of Football pitches, Tennis and Padel Courts, & The sports bar, Serving drinks and local Tapas which are all available to residents & guests to enjoy. Just up from here is the first commercial area. Here there are 2 fantastic bars and restaurants, With the Spanish Inn serving Sunday lunches, live music, and quiz & bingo nights, and plenty of other events to keep you entertained. Just around from here is the IT bar, with its modern interior, live music nights, and outdoor terrace to enjoy drinks in the sun on the day beds or outdoor sofas. Located just across from this commercial area is the first phase of luxury Villas, some of which look directly onto the Golf course, which works its way through the resort. The Golf course itself is truly stunning, designed by renowned course designer Dave Thomas, it measures over 7,300 yards in total with some very challenging and long holes. At the top of the resort is the golf clubhouse. This 2,000m2 three-story building features a well-stocked pro shop, fantastic clubhouse bar and restaurant, Glass terrace with views over the golf course, and private function rooms. 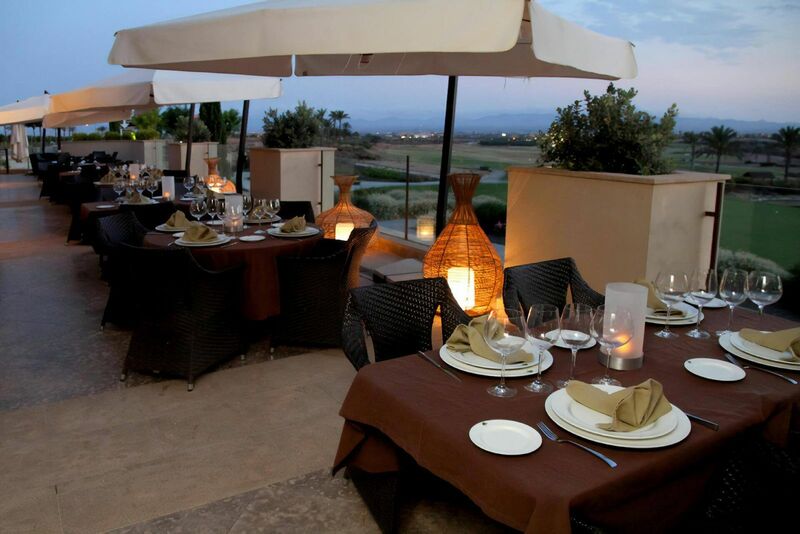 Its a great place to relax and unwind after a day on the course, or simply enjoy an evening meal from the impressive restaurant. The top part of the resort is also where you will find the Marriot Sheraton Hotel. This luxury hotel has a gym, SPA, amazing swimming pool, and a range of bars and restaurants you can enjoy. Just across from the hotel is the Spanish Village community of Pueblo Espanol. Here you will find a selection of bars, restaurants, a beauty salon and a supermarket. With more commercial units now available the selection here will only increase with a well-loved local Italian restaurant already preparing to open here. This area of the resort will soon become the main hub here at Hacienda Del Alamo and will provide owners, and visitors with a wide range of amenities. Above these commercial units are the apartments for sale in Hacienda Del Alamo Pueblo Espanol. These properties have a traditional Spanish feel and feature, open fireplaces, terracotta tiles, all set in a modern apartment. For more information on the available Apartments for sale in the Hacienda Del Alamo, Pueblo Espanol Click the Image below. Throughout the resort, as you make your way around there is a selection of Children's play areas, and parks to enjoy. With new investment in the resort, everything has a new lease of life here. Across from the Spanish village and Clubhouse is the Driving Range. This is a unique 2 story building where you can choose to fine-tune your swing on the ground or 1st-floor bays. There is also a chipping and putting area, and lessons are available from here with the professional for golfers at all levels. Further up the resort from here are some very unique properties with the community of Apartments for sale in El Oasis. These properties offer some unique features such as the private plunge pools on each balcony, Communal tennis courts, and large swimming pools. Apartments here are available in 1,2 & 3 Bedroom options, with prices from just €60,400. The apartments here are set amongst the luxury villas in this section of the resort. These properties sit in large private plots and have private swimming pools, and solariums to enjoy the views on offer. There will soon be an introduction of new Modern villas on the resort set to be available in 2019. The resort here at Hacienda Del Alamo, is now attracting more interest with the opening of the regions new International Airport in January 2019, Making Hacienda just a 15min drive from here. You are also just a 30-minute drive from the Beaches of The Mar Menor, or the Mediterranean, as well as being just a short drive from the historic cities of Murcia & Cartagena. Hacienda Del Alamo is a place to explore if you are considering a holiday home, vacation, or permanent move to Spain, with amazing properties at very low prices, there is everything you could need within this resort. To see a full range of the Properties For Sale on Hacienda Del Alamo click HERE. Or for any questions please feel free to contact us.